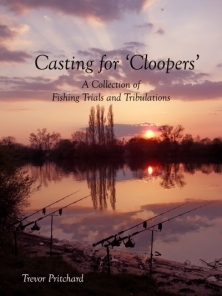 Casting For Cloopers is Trevors first carp book and will captivate the reader from the outset with its down to earth style and humorous theme. It will appeal to the 'Average ' carp angler because Trevor is, like most of us a hard working family man, with a passion for big carp. Not blessed with unlimited time, bait and free tackle as today superstars seem to be, Trevor makes the most of his angling time at weekends and holidays....like normal carp anglers have to. With that said Trevor has been very successful in catching not only some very special carp but huge Catfish, Eels and Sturgeon in his time. Probably best known for his highly successful fishing TV show ' Day Ticket ' which is still being shown on some of the satellite channels Trevor was very fortunate to grow up in the Colne Valley which gave him access at an early age to fish some of the most ' hush hush' waters in the country and to fish for some of the countries most sought after and respected carp, for those of you that read Rob Maylin's Chapters on Springwood in his early books you will see where Trevor got his inspiration. Springwood and The Bird Lake are now known by those ' in the know'....but still secret waters to most of the country. This is a book that every angler will be able to relate to, its real, and reflects the true essence of carp fishing for the normal angler......not only that but its very funny to and will have you in stitches. This is THE book to get you in the right state of mind to tackle 2013.